A monument commemorates those who perished in the H.M.A.S. Voyager collision in February 1964. H.M.A.S. 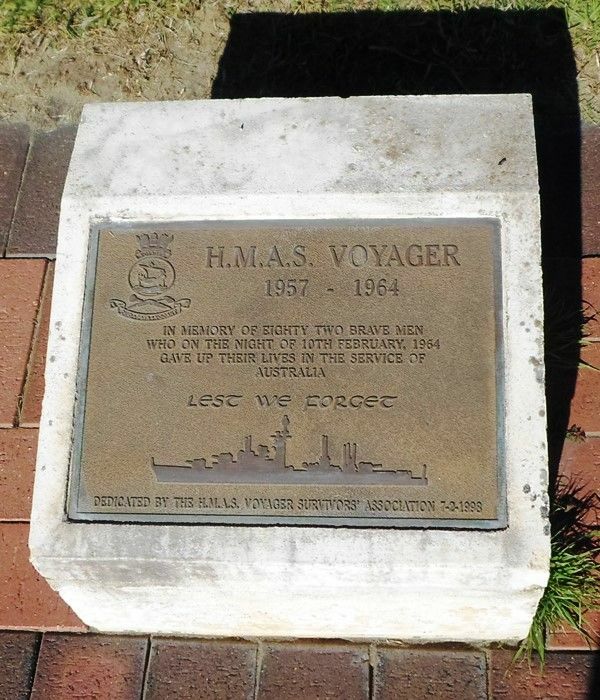 Voyager was a Daring class destroyer of the Royal Australian Navy (R.A.N. ), that was lost in a collision in 1964. During the night of 10 February 1964, Voyager and the aircraft carrier H.M.A.S. Melbourne collided off Jervis Bay, when the destroyer passed in front of the carrier during post-refit sea trials. Voyager was cut in two by the collision, sinking with the loss of 82 of the 314 people aboard. This was the largest loss of Australian military personnel in peacetime, and the subsequent investigations resulted in the holding of two Royal Commissions—the only time in Australian history this has occurred.